Bula Network began almost 10 years ago as mostly a consulting company helping clients with a variety of different business challenges. I leveraged my decades of business building experience to help business owners and CEOs with everything from marketing, to succession planning, to sales force compensation programs and just about everything in between. Eventually, the work took a turn – mostly because I wanted to stop doing the work for people and instead I wanted to help them figure out ways to do the work themselves. I went from fishing for clients to teaching clients how to fish for themselves. It was much more rewarding work. Some call it coaching. Three years ago another shift occurred, one that was very congruent with coaching. I became aware of the professional peer advisory group for CEOs and entrepreneurs. Fascinating stuff. By the Spring of 2016 a book was released, THE POWER OF PEERS. It was written by Vistage CEO Leon Shapiro and Vistage VP Leo Bottary. Vistage is a company that specializes in building 16 member in-person groups for CEOs and top leaders. The book captured both my attention and imagination. By the early fall of 2016 Leo had left Vistage to do his own thing. He was the VP of Peer Advantage at Vistage and clearly one of the chief experts in the world on the topic. As a longtime podcaster I had an idea. I wondered if Leo would like to have his own podcast. Me? I wanted to learn more. I’d be willing to do the heavy lifting to make a podcast possible if Leo was interested in using such a platform to spread the message. I contacted Leo even though I’d never met him and he had no clue who I was. After a few back and forth conversations Leo agreed to launch the podcast, YEAR OF THE PEER (2017). I was merely the behind-the-scenes guy doing the voiceover work and serving as producer. There were many world-class interviews with fascinating people. At some point in the midst of it all, Leo knew there was a book brewing, based in part on what we were learning on the podcast. Leo began to work on a book. By August 2017 Leo asked me to co-host the podcast with him beginning this year. We based the podcast on the book he was writing and used the same title he intended to use for the book – WHAT ANYONE CAN DO. In January we launched the new podcast. 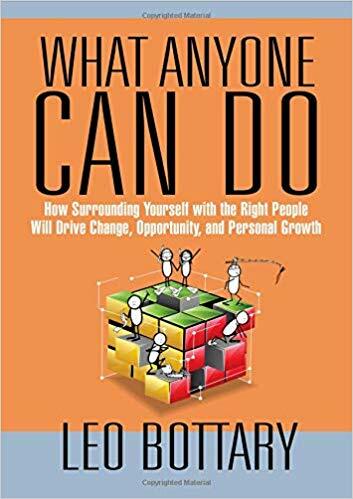 What Anyone Can Do (the book) was published this fall (2018). More importantly for me, Leo and I had become friends and co-workers on the podcast. I had been learning as much as possible about the peer advantage, especially the advantage to small business owners who would intentionally and purposefully surround themselves with other entrepreneurs interested in hitting the trifecta of business building: getting new customers, serving existing customers better and not going crazy in the process! I wanted to enter the space. Leo encouraged me. He had worked with me for quite a while now and knew my skillset. He felt I was ideally suited for the work because I’m driven to help people without telling them what to do, because empathy is one of my few superpowers and because I thrive on deep connections. In February this year (2018) I told Leo I wanted to launch a small group of just 7 business owners (the people who are the closest people to my heart). I laid out the details that I intended to launch a virtual group where we’d meet online using a video conferencing platform like Zoom where members could join using their mobile phone, tablet, laptop or desktop. We’d meet every other week for 2 hours and hit the ground running with a hard start time and a hard stop time. In between meetings we could communicate using some other technologies. Additionally, I wanted to invite friends and acquaintances with specialty knowledge to conduct live and recorded webinars for the group (content they could consume at their leisure). Leo is responsible for immediately telling me to launch two groups – one for the morning and one for late afternoon. Because (as he reasoned), “Some people are morning people and some aren’t.” That’s the power of surrounding yourself with people who will challenge you and push you. I spent the rest of the year trying hard to get things lined up so I could go “all in” on launching The Peer Advantage by Bula Network. Somewhere along the way I was even able to snag the url, ThePeerAdvantage.com. So I’m inviting you to check it out and apply. I’m going to launch it after the first of the year. You can apply by going to BulaNetwork.com/apply. It’s a Google form that will only take you a few minutes to share enough information with me so we can have a meaningful conversation. Complete the form and then we’ll schedule a quick phone call so I can find out more about you, and answer any questions you may have. Before I go today, let me tell you a quick story to help you better understand the power of joining a professional peer group if you’re a business owner. You’ve got people who love you and care about you. They’re interested in you and your life. But that doesn’t mean they can relate to every area of your life, especially your business life. It’s why husband business owners struggle to help their wives understand and why wife business owners struggle to help their husbands understand. People with no vested interest, other than to help us, often struggle to fully understand what we’re going through because they can’t really understand the context of owning a business. There are plenty of other people who surround us. Smart, bright people. Some are employees. We certainly can’t let our hair down in front of them. Since we’re the last line of defense and the first line of offense in our business, we know people are beholden to us. And that impacts our relationship with them. So it goes with people outside our company, too. People like professional service providers such as accountants or attorneys. Or vendors and suppliers. Employees rely on us for their jobs. The others rely on us as clients or prospective clients. That makes it all hard to find a safe environment where we can really shell things down, say what we’re feeling or thinking and have people who get it, people who won’t judge us and people who will help us figure it out. Did you know there is a group called Parents of Murdered Children? It’s a national organization for a very select group of people. You don’t want to qualify to become a member, but if you do happen to qualify — is there any better group you could join? I can’t imagine that there would be. You walk in the door, introduce yourself and instantly you’re connected to the group because everybody there gets it. The details of each family’s experiences may differ, but that doesn’t matter. The overwhelming context necessary for intentional and purposeful connection is present. Everybody in the group shares ONE BIG THING that binds them. Because of that ONE BIG THING every member of the group can feel safe, vulnerable and served in the group. This is the tie that binds. We can instantly relate. It makes communication instantly easier because we all get it. I hope you get it – namely, I hope you understand the potential power of being part of such a group. Please go complete that short survey right now by visiting BulaNetwork.com/apply. Then we’ll talk on the phone briefly. By the way, this is as hard a sell as you’re going to get from me. If it’s right for you, we’ll know. If not, that’s okay, too. I hope you’ll keep listening to the podcast and finding value here at Grow Great.